I got an e-mail this morning that Curmudgeonry had won an award. Fascinating, I thought -- I am well aware that the content of this blog is neither award winning nor award worthy. But no -- I "won"a designation as a Best Blog in Tennessee. Someone must have found me out through my registering for BlogNashville. As far as I can tell, all this award means is that I am in Tennessee and have a blog with RSS feed. Still, I'm not going to be winning any other awards for this drivel -- so I guess I'll take it. Will you still hang out with us little peoples now that you are an award winner? Hey, congrats! I like this place. When there isn't much to say about yourself -- why not talk about your neighbors? There is a house down the street, that was on our neighborhood home tour, that has the most interesting front fence I've ever seen. Originally, my neighbor hired a landscaper to help her redo the frontyard and she planned to put a fence around the place to keep her dogs from escaping. Then the landscaper had an idea -- why not have a landscaped fence -- a living fence? As I've heard the story, he was so in love with idea that he called the homeowner to ask her permission to do it while loading his cart with the starter materials. I watched the fence going up with some interest and have been fairly skeptical about it. When it was just sod wrapped in chicken wire, I wasn't too crazy about it. Now that the plants are in and the ivy and moss are starting to take over and everything is growing, I think it is pretty neat. Supposedly it won't require too much maintenance, though I suspect that remains to be seen. It has a sprinkler hose system in it, so the owner won't have to go out to water her fence. I do think it will be strange to weed a fence though. As it grows, it grows on me, but I still probably wouldn't put it in my yard. But you're right -- weeding the fence would be a bit weird. I think the idea is very fascinating, though it would never work well here in the desert! However, in Ecuador you coould get a tree to grow out of an stick almost anywhere, so there were always live fences... I thought the idea lovely, though it looked much different. Ooh. I think it looks cool. But won't it look ugly when all that green dies in the winter? I like it but then I'm a black thumb when it comes to yards. Heck I have had herbs die on me a week after I've bought them *sigh*. I guess having a good place to get good produce compensates somewhat. Thanks for the idea, Jordana. We've been brainstorming for fencing to enclose the garden to keep the dog out but not block the view of the pond. Do you have more construction details? I played Place the US States and find the Canadian Provinces and was pretty good at those, so I had to try my hand at the European countries when Nate linked to this quiz. I got 37/44 with an average error of 104 miles, but let me state for the record that other than Andorra and the Vatican, I couldn't find the postage stamp countries of Europe even with a map in front of me and I didn't know that Slovakia and Slovenia were on opposite sides of Hungary. Silly me. I grew up watching television like any normal person, until my family moved to small town, middle-of-nowhere Ohio when I was in junior high. The only way to get TV channels was to subscribe to cable and my parents just weren't going to do that -- at least my mom wouldn't. So no TV. We had a VCR and could watch movies, but I missed all the commercials and all the shows. In college, I spent a lot of time in the commons room of our dorm catching up on television. In grad school, I had a TV in my bedroom. I spent those years becoming a junkie. We had cable through our landlord while Justin was in law school and though I didn't watch as much TV as I had when I was single, I still watched a fair bit. I had shows I wanted to see and all that. Then we moved to Alaska and though we could pick up some channels with our rabbit ears there wasn't a lot on I wanted to see -- pretty much only Enterprise and I didn't want my son to watch TV, he seemed too little. So I grew apart from the television. We started letting The Boy watch videos as a potty training incentive -- he'd sit on his potty and by the time the video was over all the stuff would have landed in the potty. Back in the lower 48 once more, we decided DSL was worth more to us than cable. We also put our one and only TV (with a 13" screen) upstairs where our bedroom is not. For a year or more we basically watched no TV, though The Boy got a daily "lunch video" which he watched while I was getting The Girl to nap. Last year we got a second TV, so that Justin and I can watch TV at night. Except for that one brief period of addiction for me, we've managed to be a fairly low-viewing TV family. I sometimes wish the kids liked it more. I could do with more vegging out from them sometimes. The Boy's school is very anti-TV. You don't exactly have to pledge that they'll never watch it, but I think there was a question on the application that asked if you'd be willing to cut back on television if the teachers recommended it, and they hand out articles on why television is evil all the time. Really. Fine. Whatever. I let my kids watch a bit when I want to, but as I said, half the time they don't watch enough to save what sanity I have left. They haven't turned into dullards yet. I loved this article deriding TV-Turnoff Week. I'm not going to leave the TV on all week, but I know the feeling. I really hate people telling me what to do for my own good, when I can take care of myself and my family with a little restraint and common sense. We've ended the tyranny of television, but Netflix is killing us. It's like a challenge, to see how fast we can watch a movie and return it in the little red envelope -- but the reward is just another movie, and another, and another. And now they have TV series on DVD, so I can renew my love of "The Andy Griffith Show" while nurturing an addiction to "24." All this has led to an epiphany -- it's not the television stations that are evil, but the television itself. I can feel it watching me from behind the cabinet doors, surveying my comings and goings with that big square eye. We watch a lot of DVDs, but I'm totally bored by most TV shows. When I watch TV, I'm always thinking about what more productive things I could be doing. It's Thursday Three time, in which I get to fill the blog with content without working too hard. Oh right, there never is content that shows any work at all -- not even spell-checking. My first name means "flowing down" or "descendant". I am definitely someone's descendant. My middle name, Caroline, is usually given the meaning of either "womanly" or "freeholder". I'm not sure about the latter meaning, but I'd say "womanly descendant" fits me pretty well as a whole name. There were never any stickers/shoelaces/miniature licenses plates with Jordana on them. Life has been most unfair. When I was three or four, I wished to change my name to Mary Suzy. Fortunately, I grew up to like my name just fine. Since I got married and changed my last name, I've rather enjoyed moving from the end of the alphabet to the beginning and from having to spell out both my first and last names to only having to spell my first name. My older brother. His name is Andrew Jordan. For some reason, when he suggested that they name me after him, it seemed like a good idea to my parents. Bonus Question: Do you go by your first name, middle name, shortened form--(ex. Jim for James)--or by some made-up nickname? I go by my first name. When I was little -- up until we named The Boy, in fact -- I was known to my family as George. When I was about 3, my parents had a friend who said Jordana was unpronounceable and so he was going to call me George. My parents hated it at first and then it stuck. "I will love her and pat her and call her George!" My last name is Jordan (though I do that hyphen married name thing so I guess it is my middle name now) I passed it down to my 3rd son. And my daughter's middle name is caroline. I have the most boring first name of all time, popular with both boys and girls. I had a friend in college named Daniel Jordan. I remember we had a long--joking!--conversation once about how we could never get married because I refused to be Jordana Jordan. And HE couldn't take my maiden name because my dad's name is Daniel too, and we couldn't have two Daniel Ashmans, now could we? When I got married, my last name moved down the alphabet 11 letters. I'm still getting used to being in the middle of the list instead of at the top. I never considered that it would be hard to marry someone with the last name Jordan. Now Banana or Fontana -- those were the names I knew I had to avoid in potential boyfriends. Well, okay not that I actually thought too much about it. I didn't exactly have tons of people throwing out marriage proposals. I somehow suspect that your dad still calls you George! You know, in HS it took me about three months to figure out who he was talking about! I always loved that he called you that. I'm not usually all matchy-matchy in dressing my kids. It's kind of cute, but I usually don't do it -- in part because everything they wear came from Goodwill or yard sales and that makes it more difficult to get everything to match. However, I do have a couple of girl's outfits in two different sizes and due to The Girl's being such a tiny thing, she can still wear almost everything she wore last summer. Naturally, I had to stick the girls in matching outfits and take pictures. Then The Boy, who happened to also being wearing red jumped into the photo shoot. Nothing turned out very well, but I thought this photo was cute anyway. You children have the most beautiful smiles. I need to get my kids all together and clean at the same time for a photo. Three is almost impossible. If you can get seven children in the same room at the same time, I'll call you Superwoman. 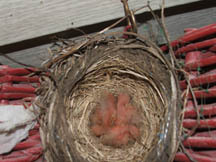 Our robins have flown the nest, leaving behind a lot off poop and not much else. It was a real pleasure to get to watch them growing over the past few weeks. I can't believe how fast they grow up. I'm glad it is taking my children a little longer before they are ready to fly on their own. The Girl has been a bit upset over the robins' departure. She thought those were her birdies. This weekend was devoted almost entirely to preparing for, helping with and recovering from our neighborhood tour -- which you can read a bit about here and here. The Girl stopped throwing up Friday afternoon and started being all perky and hungry, so we decided she was well enough for us to go to the next block for a pre-tour party while she and her siblings stayed with a neighbor who had agreed to watch the kids. After a short party and some thank you gifts for the site owners, Justin went home to put the kids to bed and I went on with the rest of the neighbors to see all the houses on the tour. We did this so that all the homeowners would get a tour, but not have to worry about running out on the day of the tour. The day of the tour dawned grey and cold and proceeded to get colder and rainy. We still had a great turn out for the tour -- a few more people than last year on a really beautiful day. The girls and I worked as greeters at a house down the street from ours, while The Boy played at another neighbor's house. I got lots of compliments on my house and hated having to deny ownership, but then again a house with only two bedrooms wouldn't work very well for a family of five, even if the bedrooms are large. One couple came to the house that had lived there in the 1940s when it had been converted into a duplex. They were amazed at how nice the house looked converted back into a single family home and remembered the original fireplace tile they'd thought was ugly back in the old days. Saturday night there was a party for everyone involved in the tour and Sunday was just a regular day of churching and regular Adams' family lateness for church. We try, but obviously not hard enough, to get places on time. Yesterday I was still recovering from the busy weekend. I had to wash seven or eight loads of laundry, water all the plants, start trying to get the house cleanish again, and those sorts of things. Today I must go grocerying and get to the library to get some new books. I've finished reading all the bedtime stories to the kids that I checked out two weeks ago. My, my you were busy! :) I wish I could take a tour, sounds awesome. Where Would We Be Without Vomit? It just isn't really a full week until someone throws up. Maybe we just have weak stomachs around here, but it seems like somebody in the family is ailing almost every week these days. Sure the house isn't spotless, but I don't think we're breeding that much food poisoning. This morning is was The Girl. She woke up cranky, whiny and lethargic. Then she looked pale and for once I wasn't the one holding the child when everything came up. Still unlike me, who always winds up either covered in vomit or catching it in my hands, my husband grabbed her, held her two feet in front of him and let her puke on the hardwood floor -- which is better than the sofa or the rug, I guess. She's all tucked in and feeling gross. It figures that someone would get sick when we actually have a party to go to tonight. Poor kid. Poor mom. Y'all take care of each other. Maybe this is what they were talking about when they said overuse of antibacterial and antibiotic products were going to come back to bite us (and not just those who are guilty of overuse!) It seems like there's a lot more sickness going around this year. Let's just hope it's not appendicitis! Oh, I hope that whatever it is doesn't spread to the rest of The Family. May the crud get no further than The Girl and may she get well, soon! Ohhh!! I was hoping you guys would make it through the week without "incident". I'm sorry! It was just last Sunday night when I was thinking, "No one puked this weekend. I don't know what to do with myself!" I couldn't believe it. I think it had been about 2 months since no one had some sort of icky ailment. Let's hope your respite is around the corner! We had a vomiter, too. I never made it to the neighborhood home tour like I had hoped :( House rule: you can leave a sick kid with dad, but not if you want vomit on the leather sofa when you return. Oohhh poor darling...I hope she gets well and stays well and the whatever it is doesn't hit the rest of the family. Am I On The Cutting Edge Or What? Slate had a couple of articles last week about the economics of names -- here and here. Since I'm such a baby name nut, I was interested in these and thought it particularly interesting to see that I'm really on the cutting edge for popular names. The name of one of my girls is on their predicted list of popular girls names for 2015 and so are several of the other names we considered. I'm such a trend setter. The more I read about Freakonomics, the more I want to buy it. I'm glad Nora's not on there... I still hope to use it some day! I thought you were hoping for Honoria, Lenise. Would that be Nora for short? I had no idea any of the names I've picked could ever be trendy ones, but if The Girl's name really does hit the big time, I guess that will always mean people will think she's younger than she really is. She can age slowly. I love names too. A lot of the names we have considered are on that potentially popular in 2015 list. It is weird though how when you pick a name out no one seems to have it, then a few years later it is everywhere. I had that happen with 2 of my kids. My oldest son was going to be named Forrest, then right before his birth the movie Forrest Gump came out and sort of ruined the name for us. Hey! We almost named Susanna "Flanery", after my husband's grandmother's maiden name. We could've been cool. 10 years from now. Oh well. Yikes, there are some really cool names on that 2015 list. Makes me worry that whatever awesomely odd name I choose will become ridiculously popular in the not-too-distant future. I guess anything has that potential. My daughter's name that is on the 2015 list isn't even in the top 1000 baby names in the country at the moment. I'm not too worried about what will happen in 2015. My main concern was that there wouldn't be tons of kids running around on the playground with the same names as my kids. I didn't even do so well at that. My son's name is not at all uncommon and there is another little girl in town with the same unusual nickname as The Girl, even though they don't share the same name. It's time for The Spring Reading Edition of the Axis of Weevil Thursday Three!. As you can see we like books. I won't bore you with pictures of the other nine bookcases. 1. Do you like to read one book at a time until you’re finished, or multiple things at once? Back in the olden days when I had all sorts of time and such, I usually had lots of books going at once. Now I'm lucky to be reading anything other than a blog entry here and there and so I usually stick to one book at a time and perhaps a few magazines. 2. Do you do your browsing at the library, or do you prefer going to retailers such as Barnes and Noble and glomming up free samples of the publishing arts, pretending you’re actually going to buy something? Library. Library. Library. I love buying new books, but I have eleven overflowing bookcases and I hate packing books up and storing them away. I'd rather check them out, which appeals to the cheapskate in me anyway, and not have to find a home for them on a new shelf. Although I probably read more stuff on the web than any where else, online is right out as my preference. That's not really a good way to read anything long. I suppose hard covers, or as we liked to call them in my librarian days "cloth" books, are the best, but unless a book is really, really old I can't get too worked up about the cover. Books are too familiar as friends to be sacred. In this house we live with them all over, which means they get bent, tossed around, stepped on and mistreated. But they are also loved. If the pages fall out of a book, we tape it back together. It's the words that matter more than what the cover is made of to me. That said, I do have a bookcase filled mostly with very old or very special books. I read from there occasionally, but the children aren't allowed to get their grubby hands on those books. A very non-specific question, I must say. I probably read children's books most often, followed by blogs and magazines next. Once in a while I get to read real books. Sometimes I like to read fluffy Regency Romance novels and sometimes more improving literature, but it's been a long time since I got to concentrate for long on much of anything. When my kids were small, I was still in the Army and the libraries typically had limits on the number of books you could check out. My family got a waiver since the four of us went through so many books. Lee and I are going through boxes of books we have acquired over the years and it has been lots of fun looking at the progression of books the kids had as they grew. My son took his when he moved out, but we still have about 100 Nancy Drew books. I found my copy of "Walden". I do so intend to read it someday. Another fan of Regencies here. Good Regencies are getting harder and harder to find as so many of the publishers aren't printing them anymore and the writers are movng to other genres. Have you read Loretta Chase's newest? The title is Mr. Impossible. It's not a traditional Regency but you might enjoy it...I did. When I was a little girl in California my mother had a lovely garden. When we moved to Arizona, not so much. In fact, most of the time we lived in a house with a desert landscape that required nothing other than a little weed pulling. When I was in junior high we moved to the fertile Ohio lands and my mother really started gardening again. Of course as a detatched and sometimes moronic teenager, I never had much interest in gardening, but I still managed to pick some things up by osmosis -- things that stuck with me until we finally got our own house a few years ago. And so here are a few tips I've picked up. (1) If you don't know plants, find a friend or neighbor to help you figure out what is planted in your yard. When we first moved in, a friend came over and asked if we were going to cut down all the "short trees with big leaves." It's true they were overgrown and needed trimming, but fortunately, I knew they were dogwoods. (2) Look at your neighbors' yards ON YOUR SIDE OF THE STREET to figure out what will work best in your yard (and condition of shadiness). My front yard has a southern exposure. What works in full sun on my side of the street, doesn't work so well in the shade of my neighbor across the street, whose yard faces north and has a large maple. (3) From looking at other people's yards and wandering through nurseries, you can find out what plants work in what kinds of light, which is important in the next point. (4) Shop your yard. When we moved in, our yard and few flower beds were mostly weeds. However, we had two giant hostas planted in full sun (they needed shade) and some lovely coreopsis (a sun lover) planted in shade under a dogwood. We also had some beautiful day lilies growing under the fence between our yard and our neighbors and a few growing at random almost inside a bush. The flower beds we had were brick lined. Before buying more bricks for new flower beds, we discovered that one of the old beds had two layers of bricks and there were bricks stacked around our shed. We even dug up the partial remnants of a brick path under 5 inches of top soil. We've found enough bricks to line two small beds and two large beds. (5) Shop at your friends' and neighbors. We brought a car full of pink, yellow and purple day lilies home from a trip to visit my husband's grandmother. My neighbor down the street gave us all the hollyhock seeds we wanted. Almost anyone is willing to hand over a cutting or two. Lots of plants need to be divided and no one wants to toss the extras. (6) Don't be intimidated into liking something you hate. I'm not a big fan of most shrubbery. The hollies and boxwoods in front of my house were taken out as soon as I could get my hands on them. Everyone raves about the expense and beauty of boxwoods, but they were not for me. Oddly enough, for all I hear about people loving them, I couldn't find a single person who wanted any of the ones I removed. So, if you hate the colors the previous owner planted or think their expensive rock garden is ugly, take it out. You don't have to live with a garden that isn't you. I've learned many more lessons -- like zinnias survive breaking only inches from the ground, anemones and freesia hate me, dahlias never look as pretty as the pictures, and that in the late summer everying needs watering -- but those are things to figure out for one's self too. In the meantime, I need to go back and practice with some new plants to see what I like and what hates me. I'm afraid my newly-purchased gardenias and azaleas are going to croak before I get to feeling well enough to planting them. There are only so many opportunities with Jay, though I'm thinking he can sit in his stroller while I work. How closely do you have to watch Bea to make sure she isn't eating wasps (one of my phobias!)? I try to work while Bea is sleeping, but often just put a blanket or two down. 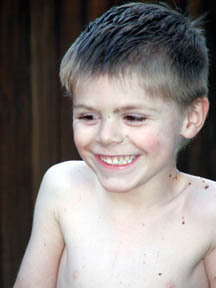 None of my kids has ever attempted to eat a wasp, though The Girl ate some kind of bug that flew in the house once. Mostly, The Baby scoots over and starts sucking down grass. How to keep her from doing that, I'm not sure. We used to set up a playpen outside for such times. They can see you, you can see them, and grass is much harder to eat. Although bugs can still fly in. What a great post! Lots of good ideas to remember. We're just now figuring out what's in our yard, almost one year since purchasing it! Between my birthday, a visit from my mother, super-sizing a flower bed and planting the 18 million plants that I got for birthday presents, I have been very, very busy. Especially, because it isn't like my children stopped being themselves. The older two fight and The Girl keeps wetting her pants when I don't take her to the bathroom fast enough. The Baby has been getting more grass than any other form of solids and despite sunscreen we're all getting awesome farmer's tans. My garden is looking pretty super at the moment, although I still have a lot to plant. We put in tomatoes, okra and zucchini today and I planted pots of basil and oregano to go along with the pots of blueberries and strawberries that I planted last week. Now that the expanded flower bed is finished, amended and tilled, I have some hydrangeas, a couple astilbe and a bleeding heart (the only one you'll find around this house) to plant. I also plan to put some of the bajillion hostas that I took out of the bed back in, but I need to divide and pot most of them, until we do the planned path down the side of our house. Photos will probably be coming soon. It's almost the end of a busy day, but I decided to pop over and mention that I am now entering a new decade -- unless of course one wants to get pendantic about how to count it up -- but none-the-less, I am now a thirty year old and have left my twenties behind. While I'm not terribly bothered by that fact, it also seems a bit strange and hard to believe. Do I have to be a grown-up now or may I still whine like a toddler now and then? Never grow up; at least not all the way! Happy Birthday! I've never understood the big deal with the number 30. It's just another step on the path, you know? May your life continue to grow more rich and full over this next year and beyond. I'm 33 and I still whine every now and then. Doesn't every over-30 year old? Happy Birthday! Welcome to the 30s. We've been saving you a spot! Embrace 30, it is a wonderful new phase that can bring so much more to your life. But then, I was single, and going to medical school in South America when I turned 30. 30 entitles you to not only whine, but whine with a demand for respect! Happy belated birthday! If we over-30s are not allowed to whine, nobody told me. And hopefully, no one will! Happy Birthday to a great Curmudgeon! You'll find the 30's some of the best times of your life, if you can find the time reflect when you're not chasing after yung'uns. Happy birthday, belatedly. Hope it was a good one! Gee whiz--I go out of town for a couple of days and you age an entire year! All the best, of course, no matter how belatedly the wishes might arrive. Aw gee...you're so young!!! And much more "with it" than I was way back then! Happy Birthday--and how many Jordanas do YOU know? :) It must be magnetic; I've met 4 or 5. I found your blog while googling my own in a fit of extreme egotism ("Am I famous yet?"). Anyway, nice to meet you, and enjoy your entry into a new decade! Happy 30th Birthday....just wait, it gets better by the time you hit 40!! Being late for things like this is normal for me. I tell everyone my Indian name is Running Behind. Remember when you thought 30 was old? Doesn't look so bad now, does it? Chris has a story of why one sometimes needs to distrust, but verify. Yikes. When The Boy decided to get really enraged and throw himself with great force off my shoulders at the age of 17 months, he incurred a skull fracture and a nasty concussion. He spent two nights in the Phoenix Children's Hospital -- in part because he couldn't keep anything down, got dehydrated and for the longest time no one would give him an IV. But even through all that misery and worry, I remember how adorable he looked in his little hospital gown and finally after he got his IV how cute he was pushing the cart around calling it his "car." And now seeing Angie's pictures, I can once again say, kids are cute in hospital gowns, even though seeing them in one is not something I ever hope for. But the good news is that Lydia's home. Hooray! Wow! 17 months??? Mark and I were just talking about 3.5 years is probably a good age (if there is such a thing) to be in the hospital--from the parental perspective. She's is old enough to tell us what hurts and respond to our questions, but young enough that she probably won't remember too much of the experience and she is still entertained/pacified/sedated by 24 hours of TV (I'm telling you if I ever see another Wiggles video, you will have to pardon my involuntary screaming). Anyway, she is home now. We are very glad. yay!!! Today was such a lovely spring day that the kids asked if we could have a picnic outside. The Boy decreed it too sunny out on the grass, so we put a blanket on the shady part of the porch and proceed to dine al fresco. And then from one side of the yard, in flew the Mama Robin. Then from the other direction Daddy Robin arrived. And there were worms for the baby robins' lunches. Yum. And sure enough as the kids and I watch, little head with wide open beaks poked out of the nest and scarfed down all the food their parents had brought. How cool. It makes me feel rather guilty that I even tried to discourage the birds from nesting on the porch, but I was afraid they'd lay their eggs and then be scared off by us and abandon their babies. I'm glad to know robins don't scare so easily. I was just telling Jay that he looks like a little baby birdie when he is into eating. He opens his mouth as wide as he can and waits for the yummy food! What a lovely gift for your family. If all holds up, fledging might be great fun. In a fit of optimism and having a coupon for free plants, I ordered a bunch of everbearing strawberry plants to grow in a strawberry pot. I researched (Yea! for Google) and discovered that the recommended method is to take a length of PVC pipe, drill holes in it, fill it full of rocks and thus provide an irrigation channel down the center of the pot. All that was easy enough and I got to show my son that mommy knows how to use a hack saw and a drill just like daddy. What I did not find out and am as baffled about now as before I undertook planting my little strawberry plants is how exactly one keeps from pouring expensive potting soil out of all the holes in a strawberry pot and thereby looking like a complete moron. Fortunately for my ego, I don't think any of my neighbors were out watching. After the convenience of living close to work, church, stores and all that, one of the things I like best about my neighborhood is how neighborly it is. I know almost everyone on my block and several people up and down all the surrounding streets. We wave. We chat. We stop by and visit. All this friendliness is facilitated by our voluntary neighborhood association. It is through being part of our association that we have met our neighbors and joined in neighborhood progressive dinners, clean-ups, play groups and all sorts of other activities. Now it is almost time for one of the two biggest activities our neighborhood association does -- a neighborhood tour. Thanks to a grant from the Mayor's office last year, we were able to pull off a tour and raise enough funds to continue having tours and to do more neighborhood projects along the way. So here comes the second annual tour. I think it's a cool way to get a peek into some of the houses I haven't seen the insides of, but it is also nifty to work together as a neighborhood and be able to say "We're growing, rejuvenating and bringing life back to a old area that had fallen way, way down. Come see!" OH, I wish I could go to Nashville! I love neighborhood tours. We had one here in October (when we first moved and before I knew anyone), and I loved seeing inside the houses. I can't wait till the next one! Our house has been on the tour before but back when the POs were alive. They had lots of antiques, and it seemed the furniture was half the focus on the tour. Don't think ours will be joining the tour any time soon. Yes, Kristen, it would be right up your alley. Especially since my neighborhood is mostly folk Victorians and so that's mostly what will be on the tour. 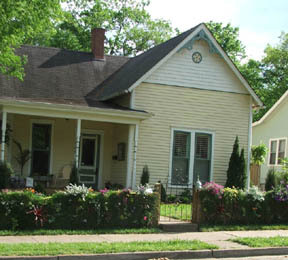 There will also be one old Victorian house from the 1870s that was restored after once being condemned. That's the one I really want to see. Seriously, I may come! I'm a sucker for house tours. We looked and looked for a home in your neighborhood last year, but couldn't find anything in our price range (within our ability to renovate). I really miss living in the center of town now that I'm out in the 'burbs. I don't know if I can say The Baby is crawling, but if you put something she wants 4 or 5 feet in front of her, she'll drag herself with her arms and shove off with her toes until she gets to it. She's definitely not an immobile lump any more. Current favorite things to chase include magazines and shoe laces. She's sort of like a kitten. Fortunately, neither magazines nor shoe laces sit around in her reach all that often. I'm trying to warn the older kids about the dangers to books left unattended and I'm policing the area for small toys more regularly. Jay still enjoys gnawing and crumpling magazines and colorful ads. So far, he hasn't found anything with "delible" ink, thank goodness. I'm keeping the home-printed photos far, far away from him. 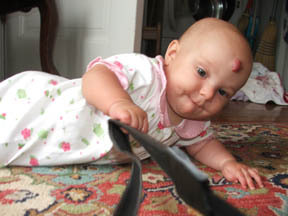 I think that qualifies as a crude form of crawling. Congrats! Now, let the daily vaccuuming begin! Well I'll be! What a cutie pie with a very unique crawling mechanism! And you caught her in the act! What a cute photo. My porch visitor's little ones have arrived. Last night we all sat out on the front porch for the opening of ice cream sandwich season and the robin flew away. We decided to get the step ladder out to peek at the eggs. Only the eggs weren't there. We have three featherless and quite ugly babies instead. I'm sure their parents think they are beautiful though. Awww- they're little pink babies- they HAVE to be cute, right? What a great thing for the kids to get to watch and learn from. 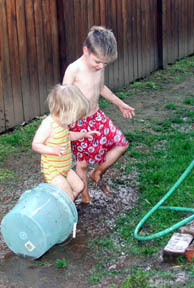 I bet they loved it- I wouldn't know 'cuz my mom would never let us get that dirty- the house was messy enough without our tracking mud in. You're a fun mom!! Look at your beauties! I'm happy just looking at them. How fun! 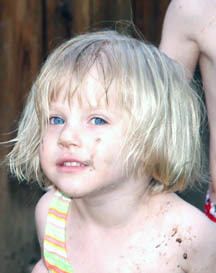 I loved playing in the mud, almost as much as the boy and the girl seem to. I can't wait for Josef to want to do this! Have they gotten to the point of making mud pies? Mmmmm, rich and creamy, with a bit of crunchiness! Do you also enjoy dabbling in mud yourself - like pottery, for example? Marc, they haven't made mud pies, but they cook plastic bugs in their toy kitchen. Nothing says, "I love you." like a piece of plastic cake with plastic bugs sprinkled on top, you know. And no, I've never been potter or anything. I've taken a few classes, but I've found that I have no talent for creating in 3D. The first anniversary Thursday Three is also the very first ever Thursday Three in Terry's new mu.nu home. To make sure everyone understands the randomness of these questions and probably because Jim forgot to send him anything, we have an extra, especially random set this week. #1) If there was one thing you could change about the way you look, what would it be? Like so many other people, I'd dump the gut and the related stretch marks that came with child-bearing. I never knew how good my stomach was until it was gone. Sigh. 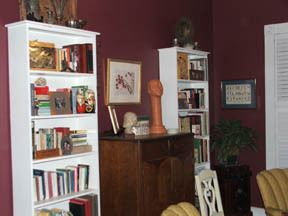 #2) In your house, right now, what is your favorite piece of artwork that you have displayed? I'm actually not sure what my favorite piece is. I have a lot of things I painted myself and a few other neat things that I like. But since I was just chatting about this with friends, I do happen to have a little tour of various pieces of art in my home, that I won't worry too much about anyone coming in to steal, because none of them are worth much. Link removed to tour of "art" in my house. E-mail me if you want to see it. #3) What person living now would you most like to meet? Terry, of course. If you mean famous people, I don't really know who I'd have much interest in meeting although I do think some of the writers for National Review would be great to know. I'd love to walk dogs with Jonah Goldberg and I'd like to have dinner with Jay Nordlinger, although I think I'd feel like an uneducated rube if I tried to talk with him. I'm sure he'd be very polite about it though. I love your artwork, Jordana. And BOY, you gots a lots! In case anyone wants to use it, I set up a York account under the name Nigel Tuffnell, password spinaltap. OH! And next time you're in Birmingham, we'll eat some lunch! I hope you'll be polite if I start looking like an uneducated rube while we're eating lunch. Not that I'd expect anything else from you. Seeing as how I tend to set the standard for uneducated rubes, I don't think you have much to worry about. Great artwork. I'm partial to your paintings with the clear glass vases. Very, very nice. Don't think of your stomach as gone, just missing-in-action. I know mine is underneath my chubbiness somewhere. I liked the concept of walking dogs with Jonah. It would be a chance to be sociable, and you always have the dog to distract you if an awkward moment came up. The big question: would you go with the plastic bag for poop patrol/clean-up or would you go upscale with one of those carry-along metal scoopers? I especially like your self-portrait and the painting of your brother. What sort of technique is that? Does it have a name? I enjoy Jonah and Jay, but the Derb is my favorite =] Impromptus, though, is great! Janis, I don't know if it has a name. You draw the image in pencil and then paint multiple layers of tempera (not egg tempera) around the drawing leaving a bit of space around the lines. Once you've built up 3 or so colors of paint everywhere, you paint india ink over the whole thing. When that's dry, you take a damp sponge or cloth and start rubbing. The india ink covers the pencil lines that you didn't cover with paint, but rubs off to reveal the layers of color in the other areas. Lenise, I do like Derb too. It would be fun to go play in the Derb family treehouse. I own one baby bottle for the very few times I've had to be away from my babies. The Boy drank out of it once. The Girl used it once or twice. The Baby has actually been away from me more than either of her siblings. She may have actually gotten five or six bottles. I'm putting that expensive Medela breast pump to good use, let me tell you! I hate baby bottles. I hate the thought of anyone feeding my baby other than me. I'm selfish that way. Fortunately, my husband and I worked out a deal with the first baby that I fill them up and he cleans them up on the other end. I get more of the baby spit up, but that's a price that I'm willing to pay. So as a breastfeeding, sling-using mama, I think I'm modelling for my children what I hope they too will support some day. The Boy asked for his own sling when The Girl was a baby and he still carries stuffed animals around in it once in a while. The Girl converts blankets, spit up rags and other things into baby slings. Between times when she tosses dolls across the room or steps on them, she's there taking care of them, comforting the babies and feeding them. But she's quite the literalist too. 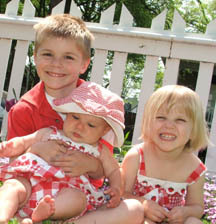 If you tell her she's a good little mama, she quickly denies that these are her children. She's not mama, she says, she's just taking care of them. And she never nurses her babies. She finds a cup or the one lone doll bottle that I haven't thrown out and feeds them. I asked her why she didn't give her babies nur-nur (our family word for nursing). She quickly responded, "But I don't have some nur-nurs. Do you want to feed my dolls some nur-nur?" I do hope that one day, when she's all grown up, she won't throw her children across the room or step on them and that when she has nur-nurs of her own, she'll use them. Until then, I guess she's right. She isn't actually a mama and she doesn't have any nur-nur in there. Wow, I remember seeing The Boy in his sling at a wedding. He looked pretty blissed out at the time -- glad to hear he and the others are turning out so well! Clearly you are doing something right. Hope everyone is feeling better. I thought we had it bad around here, but a three year old with a burst appendix is much, much worse. Mom would have gotten the message anyway, but what a blessing that the child was so articulate. to point you to Terry's new home in the Mu.Nu collective. Although, I suppose all of my readers probably already knew that he had moved. Thank you for the plug, Jordana--but most of all I wish to thank you for nominating me. I wouldn't have been able to move without your kind and gracious assistance. The whole family, with the exception perhaps of the baby, is diseased. I have pink eye and a head cold with a really painful sore throat. The Boy threw up all over my bed this morning. The Girl still has pink eye and my husband just got over four days of fever and chills and pink eye, but still has pain in his ears and a general feeling of nastiness. I feel like posting a quarantine sign on the door. If you don't hear from me for a while, I'm probably lying down somewhere whining. "Alms for an old ex-leper?" Feel better, everybody. Maybe the small one can take care of all the sickies? Oh, I do hope you all feel better! So sorry to hear it! You and Angie just can't catch a break. At least I'm the only unwell one in my house, and it ain't catching. Hey, I'm with you on the whole barfing thing. YUCK! Lydia's favorite "pink blankie" has had to be washed about 4 times in the last 3 days. I’ve been whining to Terry using email for a couple of days. It makes me feel better and probably bothers him. That’s what I call win-win. And ask that You send a special healing touch their way. Take away their infirmities and bless them with good health. All praise to You, our Healer and Redeemer. So sorry you're still sick at your house. It's so wretched...just wanted you to know I'm feeling your pain. Then The Baby has now eaten her first solids. She's been trying to grab everything off our plates for a while and so I finally broke down and offered her some cereal on Saturday night. She loved it. I'm not sure what's to love, but she gobbled it up. The Baby turned five months old last Friday, started solids on Saturday and started rolling over without much effort from her back to her tummy on Sunday. She's been rolling from her tummy to her back for a while now. She's also getting good at getting her knees under her and propelling herself at things she wants to reach. Wrong place, but I'm going to face this with Mr. Possum's new site and he's having enough issues today. Any ideas why your Munuvian site refuses to remember my personal info even when I ask it to? It's not that I can't retype everything every time, I'm just lazy. I don't know, Dan. It makes me retype my stuff every time too. I figured maybe it was a Firefox problem, but maybe not. I'll see who I can ask. I just left a comment similar to Skinnydan's over at the mu-nu Possum site. I have a hunch it's a security setting, possibly related to Java. I'll let the mu-nu crowd do the digging, though. While there's a part of you that loves your baby just as they are, you also love to see them grow. Bea should be close to the age for learning baby kisses, the drooly-kind of course. Good- I'm not the only lazy one! Bea is quite the impressive baby with her lunging already. Jay is still working out the lunging thing, though he did a good imitation of a crawl just before bed tonight: one arm, one leg, one arm, one leg or something like that. Up in the corner by the webpage address. I got myself an icon. Inspired by a question over at Dr. Weevil's site, I decided I needed an icon. Not that I had anything good to make into an icon, but I had to try it anyway. I used AWicon Lite to make my icon. It seemed to work fine for the assigned task. I can't see your icon on the page, but when I saved it to my "favorites" list it showed up. Very nice! Yep, to see icons you have to have saved the URL into the favorites list! Are you using Firefox, IE or something else? For me they just show up with Firefox. Shows up great in Mozilla! Love it! My dentist is nice enough for a dentist, but I want to find a dental spa. TexasBestGrok has put together a great looking Carnival of the Recipes. Since I'm in a photo sharing mood, here's a picture of the kids reading on the front porch in while waiting in anticipation for their dad to come home from work. By the way, The Boy is reading Asterix, SkinnyDan. Are those your own Asterix or the ones your dad had? I need to get me some of those! Kendric trashed most of the Asterix we had growing up with lots of use, but my mom is supposed to be bringing any survivors down next time she comes to visit. I think this particular book is one we gave to Justin's youngest brother that he passed on to The Boy, because Justin's brother was never interested. I should see about getting them in German... that and Tin Tin! Hey, at the funky German hippy private school... are they teaching German? They start German in first grade. The Boy is very excited, because then he "can read the Asterix we have in German and understand our German Little Mermaid CD." I must have asked my poll question in the wrong forum. Clearly there are plenty of Asterix fans around, just not reading my blog. I'm just jealous that the kiddies are wearing shorts. It was about 45 here yesterday. Here's what is blooming now. Beautiful! I love soft pink tulips. The leaves of mine are emerging, but crocus is the only thing blooming. Someone has moved onto my front porch. Update: My husband informs me that I need to provide more pictoral context for where our birdie visitor is living. Right next to the door? Poor thing'll go crazy, with all the traffic so close by. Maybe you should move the red heart-shaped basket somewhere else, so the birds will have more peace. I puzzled over the first picture, trying to figure out what it was, so hubby was right! 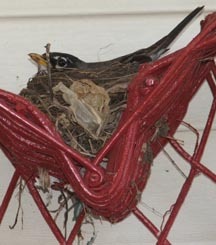 Birds seem bound and determined to nest on our porch. Every year they try to build nests in our porch lights. We've taken to leaving the lights on full time to discourage this. One year we let them nest there and agreed not to turn the light on. Then we went out of town for the weekend and our neighbor turned the light on, killed all the eggs and almost caused a fire. I don't think nesting by the front door is a great idea, but it would be very hard to move the nest now. I actually got rid of the first one they built while they were in the process. Foolishly, I hung the heart back up. By the next morning, there was a completed nest with a resident. She plans to stay though. It takes a lot of commotion to make her take flight. Normal coming and going don't seem to bother her. That happened once to a wreath on our front door! We had to go in and out a different way for awhile. 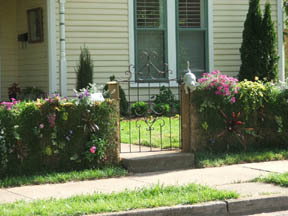 I LOVE the look of your front porch! So cozy.